The title of this post will sound strange to everyone living in 2024. How could people all over the world come to believe that a small group of powerful bankers, central banks, could use their “tools” so that the nations of the world could eventually reach a point where the public at large did not need to be concerned about a major change in prices? No matter what negative event shook global financial markets, these “money fireman” were always standing ready to pour on MORE debt and/or use various manipulative tools to “assist” investment markets until things “returned to normal”. Let me illustrate with a recent event for us, which by 2024 will be studied as history. It is called the Brexit. This was a public referendum where the British people voted to leave the European Union on June 23rd. 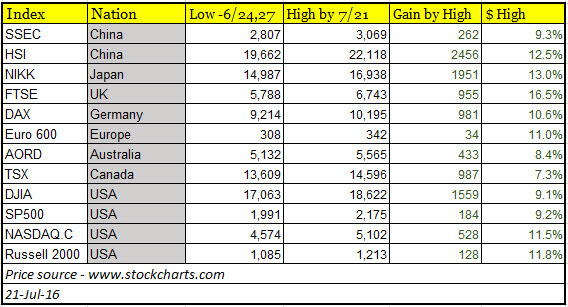 Friday the 24th produced big drops in stock markets around the world. Yet the monetary fire hoses were ready, as demonstrated by comments from the big central banks listed in this article on that same Friday. 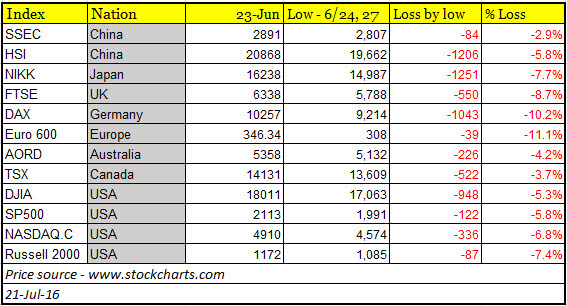 Four weeks later, not only have the events of June 24th been quickly erased, but they and other high risk developments over this period as seen through “the markets” can be viewed as no big deal. Risk? What is that? This global “rescue” did not take place during the Great Recession in 2008. This did not take place in 2009 when the Federal Reserve started “temporarily” buying up toxic assets (mortgage backed securities) from the banks in order to free up credit. This is July 2016, the 89th month since the March 6, 2009 low. It is impossible to believe that “stability” was the goal of central bankers. 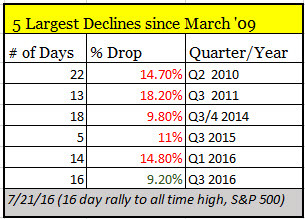 If the objective was to calm markets, they failed. The view of risk has now become, “This is great. 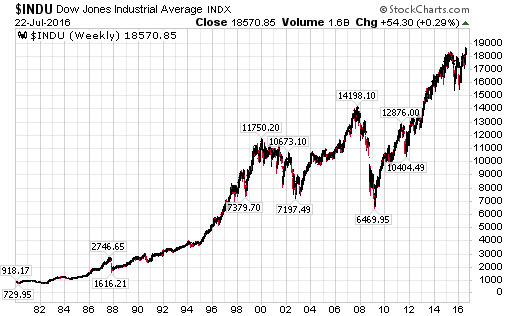 Central bankers will drive up my stock investments very quickly, and if U.S. stocks, push them to new all-time highs! The problem, as you know, is that these major central banks have been “rescuing” the nations of the world with more debt since the Great Recession, than any time prior to 2008. So why are there still millions of investors sitting in US stock funds at the highest prices ever recorded, when with each passing week there are myriads of reasons the dominoes should start falling? The financial industry was taught, and thus passed on to Main Street investors, the idea that no matter what happens, the American stock market ALWAYS comes back. Why study lessons from 400 years of financial history? What’s wrong with US and world debt loads’ soaring? 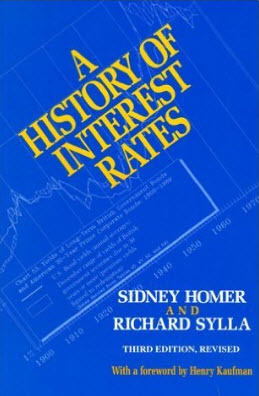 We have seen interest rates drop since the 1980s. 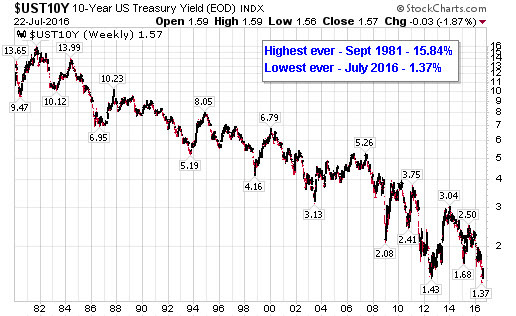 In the US, the highest levels ever seen were in 1981 when the yield on 10 year US Treasuries reached 15.84. Now this month, on July 5th, the yield on the 10 year hit a low of 1.37. This low was the lowest ever in American history. If we can all look back and agree that it was obvious that rates would fall from the highest levels on record in 1981, can we not also agree that rates at some point would rise? While this 36 period has rewarded bond investors who have seen prices rise as yields have fallen, are these same investors considering this piece of history? Having become a world where our own experience supersedes the lessons from history, how should public perception change when stocks go down, and rates rise? In 2024, the answer will be yet another story from the annals of financial manias. Everyone will understand that “the state” could never stop investment prices from deflating, since they were the very ones whose actions and polices over inflated them since 2008. Sadly, this has created not only enormous financial problems across societies, but reduced the critical importance of ethics in a sound financial and economic system. This entry was posted in Uncategorized and tagged central banks, debt, denial, ethics, highest ever, lowest ever, money, rigged, stock market, Treasury yields on July 21, 2016 by Doug Wakefield.